Periodically, trees need pruning to maximize their value. They naturally develop dead wood, unruly branch structures, and excess canopy, among other things. These naturally ocurring issues can easily be address to ensure the tree remains healthy and strong. Events can damage trees - from trucks running into them to snow causing branches to break. Fixing these problems maintains the integrity of the tree and extends its life indefinitely. Common repairs may involve cabling, bolting, and cavity repair. 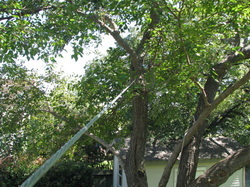 Our experience will get your tree repaired quickly and effectively. As living organisms, trees can suffer from a number of health problems brought on by animals, insects, and various microorganisms. Our experienced certified arborist can inspect your tree and determine the cause of the issue and put together a treatment plan that utilizes both prevention and treatment. Sometimes trees need to be removed from a property. For many reasons they may have ceased to provide value to the property. We utilize safe practices to ensure any buildings or property are protected while the tree is removed. By using personnel, ropes and rigging equipment we can methodically disassemble the tree where it stands. Stump grinding will remove the base of the tree and core roots from the location. Our process for ensuring that your trees receive the nutrients they need is based on our extensive experience working in the Dallas/Fort Worth area. For the black clay areas of Dallas and its surrounding areas to the looser soils found west of Lewisville, we have proven methods for ensuring your trees are vigorous and healthy. Our soil management also includes consultation on water management to prevent unnecessary water usage. Occasionally, tree owners lose trees to a variety of causes - weather, disease, lightning, and human activity. Trees have a quantifiable value and the loss of that value can be offset by adjustment of property taxes, income taxes, and/or insurance. We can provide a realistic value of your lost tree. The key is involving us immediately so that we can appropriately document the loss and provide an accurate appraisal to you. Not all trees work well in every application. Factors such as proximity to buildings and utilities, moisture, and soil type play a part in determining what trees will work best. We can advise you on trees that will work well in the location and application and install the right specimen for you. New trees can have a difficult time getting established in your landscape. They just sit there, the same size for years, with the stakes still holding them up. We have a program to more quickly establish your trees and speed up their growth. This tailored program includes root stimulation, fertilization, mulching and staking as needed. For residential lots that are in need of clearing of brush and unwanted trees we can provide a service to clean the property while preserving the trees you wish to keep. This service includes killing noxious plant pests like poison ivy and greenbriar.